So I just posted the progress pics from this last big piece I was working on, but they are from several weeks ago. I just spent the last eight hours finishing it while watching Stranger Things. I loved it, but why is Winona Ryder not aging? Anyway, my husband spent much of my birthday documenting works in frames for Superfine! All works will be for sale! All of the pieces above are 8x8 inches in a 10x10 inch frame. This piece is 18x18 inches in a 20.5x20.5 inch frame. It is my favorite and I am afraid it is not going! Not enough wall space. again, with the embroideries. I just love this work by Michelle Kingdom. The images are so painterly, textured and detailed. I dearly want one for my own. Her little dreamscapes are full of mystery. You can see her work on her website, she is one of Designsponge.com 18 embroidery artists to watch on instagram, and she has been featured on thisiscolossal.com. "Some imagined future" by Michelle Kingdom. Is the RISDXYZ. It is the print magazine for Rhode Island School of Design Alumni. I am consistently amazed at the talent, scope and ambition of the community I went to school with. It is remarkable and inspiring. I often dream that I have gone back to get another Masters degree in painting, sculpture and fibers...to explore the other areas I never had a chance engage in. This issues cover featured the work of Sophia Narrett, a painter who began embroidering her narratives. I love how she plays with the edge of the frame, with negative space in the interior of the image and with the drips and pulls of embroidery floss that start to feel think like paint. The images are so layered and full that it takes multiple viewings to really discern the entire narrative. And the textures and color are so rich and evocative that you can get lost in the beauty of the stitching in and of itself. Thank you RISDXYX for introducing me to her work! I am so happy to be featured on one of my favorite art embroidery sites...mrxstitch.com! I have found so much exciting contemporary work on this site...it inspires me to keep making. Please take a look at it and browse the archives. You won't be disappointed. And thank you Jamie Chalmers for including me! contemporary embroidery again. Look at these lovely images by Melissa Zexter I recently found. 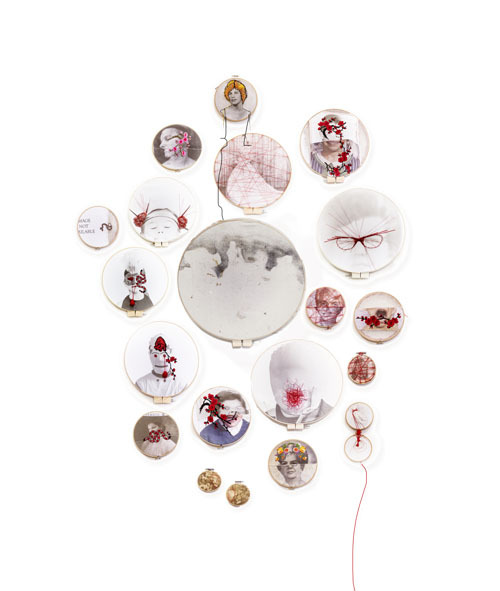 She is a photographer who embroiders on her images. You can see some of her straight photographs on her website. They are just beautiful. By Erin Endicott. 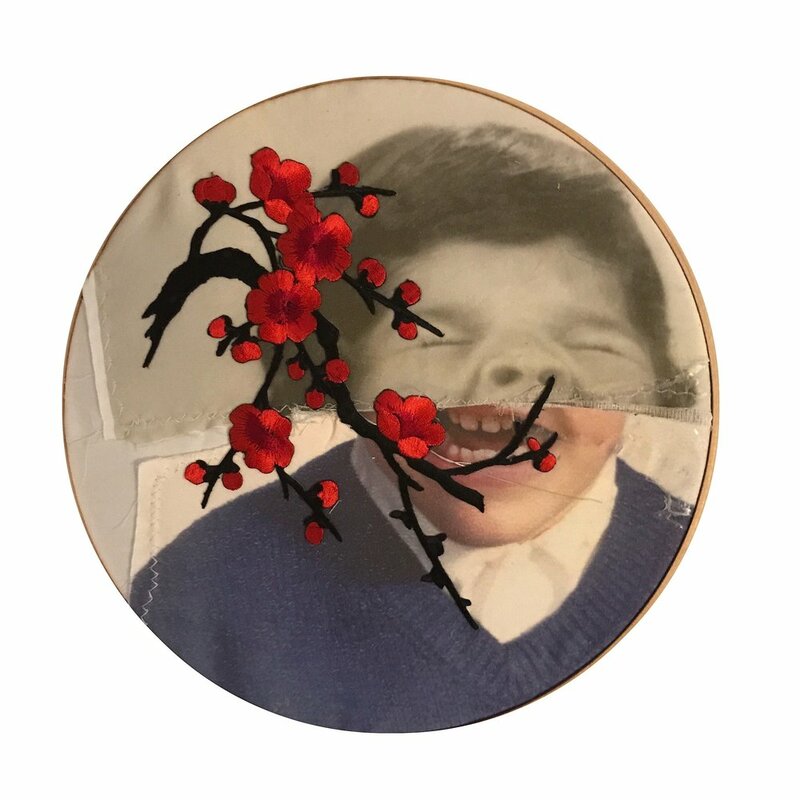 She uses found materials, hand dying, painting and tactile embroidery to create these lovely little portraits of pain, healing, innocence, and femininity. Please visit her website here. You can also find a wonderful interview with her on TextileArtist.Org.